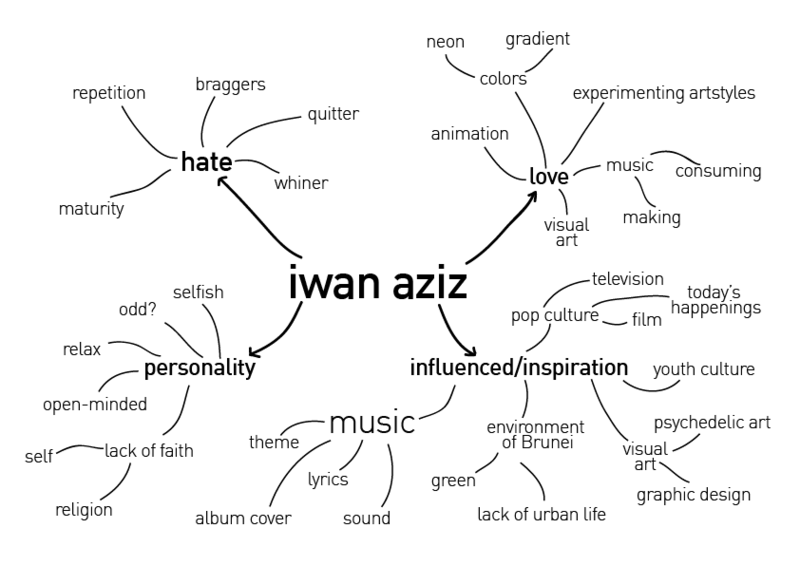 Things I’ve focused on for “self” mindmap are things I love, hate, personality and things that influence/inspire my creativity. …who is the fairest of them all. 5 different sketches of myself consisting of different art styles. Some inspirations came from clean-vectorized illustration and horror manga art style by Junji Ito- famous Japanese horror manga artist known for it’s dark and detailed art. 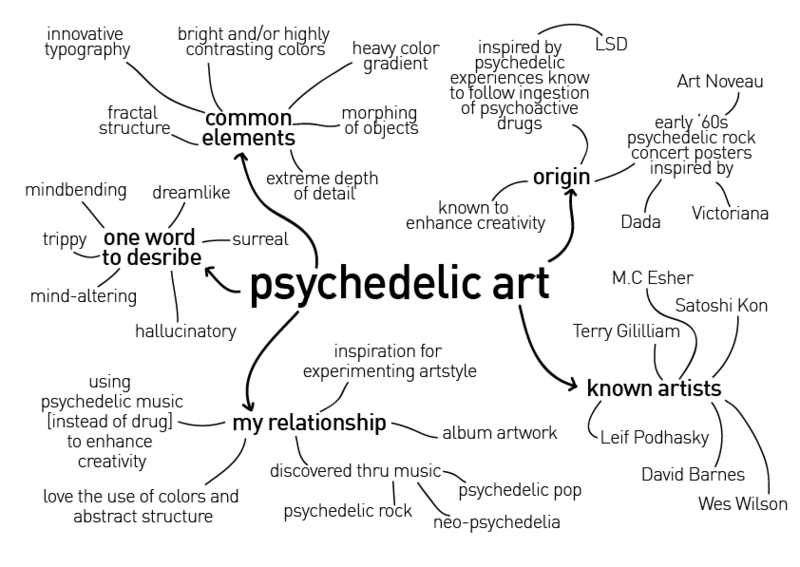 I have chosen Psychedelic Art as my preferred Art Movement for the assignment. From the past, I have developed a special relationship with it; starting from listening to the genre psychedelic-rock to being inspired on experimenting with it. Example here seen on my portfolio site. relating to or denoting drugs (especially LSD) that produce hallucinations and apparent expansion of consciousness. Starting from a discovery of LSD to an early experimentation of its effects on artists; it was almost unanimously agreed that the drug does enhance creativity. LSD’s major side effect; hallucination would be the major contributor to it’s aesthetics. The art movement though didn’t fully start gearing until such art style was used on psychedelic rock concert posters. Some of the artworks done by known artists are Wes Wilson, Bill Graham, Bonnie MacLean and Victor Moscoso. The posters from Fillmore concerts were among the most notable of the time. Common elements present are the richly saturated colors in glaring contrast, elaborately ornate lettering, strongly symmetrical composition, collage elements, rubber-like distortions, and bizarre iconography. The style continues to grow from about 1966 to 1972. Quickly becoming influential, it spreads to other mediums such as album cover, comics and many corporate advertising products. The early years of the 1970s saw advertisers using psychedelic art to sell a limitless array of consumer goods- ranging from hair products, car to cigarette and even pantyhose. 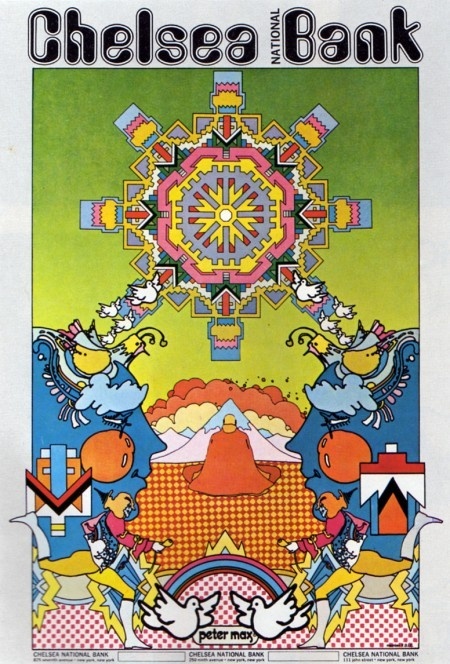 Another example of corporate ad is the National Chelsea Bank by Peter Max. In today’s digital world, psychedelic art have evolved from rock posters to graphic design to algorithmic art. Image software such as Ultra Fractal can now easily make colorful fractal art. DeepDream, a program from Google which was aim to identify objects on an image and classify them have unexpectedly found to affect the image with results of pareidolia, surrealism and -of course- psychedelic. Posted on August 6, 2015 August 10, 2015 by iwanaziz	This entry was posted in Uncategorized. Bookmark the permalink.